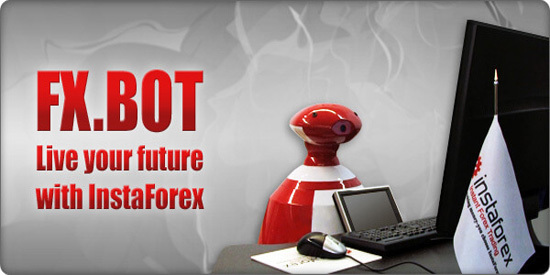 Fx Bot is the first Forex droid in the world, as well as the member of InstaForex team which symbolizes the effort of the company to provide the latest innovations in the sphere of trading to its clients. Fx Bot, created on the basis of telepresence, was constructed by R.Bot company in Russia - the country with centuries of scientific and technological history. The Russian development of a mobile robot is know-how in technology, which embodies a dream of any businessman to be in a lot of places simultaneously. At financial exhibitions, where InstaForex presents its services and possibilities, you can have a unique chance to find out more about the robot and to speak to the technical miracle - the Forex robot Fx Bot - which will consult you concerning every issue of trading. InstaForex: always one step ahead!